I recorded 2 new albums in January. Eight Track III and a Quartet date with the great Walter Smith III (which will be out in 2020). I also just returned from being a guest with the WDR Big Band in Cologne Germany for a week. My good friend Bob Mintzer arranged and conducted 8 of my songs and we recorded an album, made a live video and played a few gigs. Hopefully the recording will come out next year…. Upcoming I’ll be in Palermo Italy Apri 23-28 with the Samba Meets Jazz Workshop. Then I have a bunch of CD release gigs coming up in May-Aug… Please check my itinerary page for full listing of gigs. Thanks to the readers and writers who voted me once again into the 2018 Downbeat Readers Poll and Critics Poll. Much Appreciated! Huffington Post – Ralph Miriello,Cadence Magazine – Larry Hollis,Bill Milkowski ,All About Jazz – C. Andrew Hovan,Positive Feedback – Marc Phillips and Curt’s Jazz Cafe. Eight Track II held the #2 position on JazzWeek Radio Chart for 3 weeks and has stayed in the Top 5 for 9 weeks! I’m so happy people are digging the new record. If you haven’t got your copy yet you can order it right here on the website. Eight Track II has held the #2 position on JazzWeek Radio Chart for 3 weeks now. I’m so happy people are digging the new record. Had a great string of gigs just now including LA, Indy, Monterey Jazz Fest, Clark Univ in Worster MA, Athens GA and the Savannah Jazz Fest! 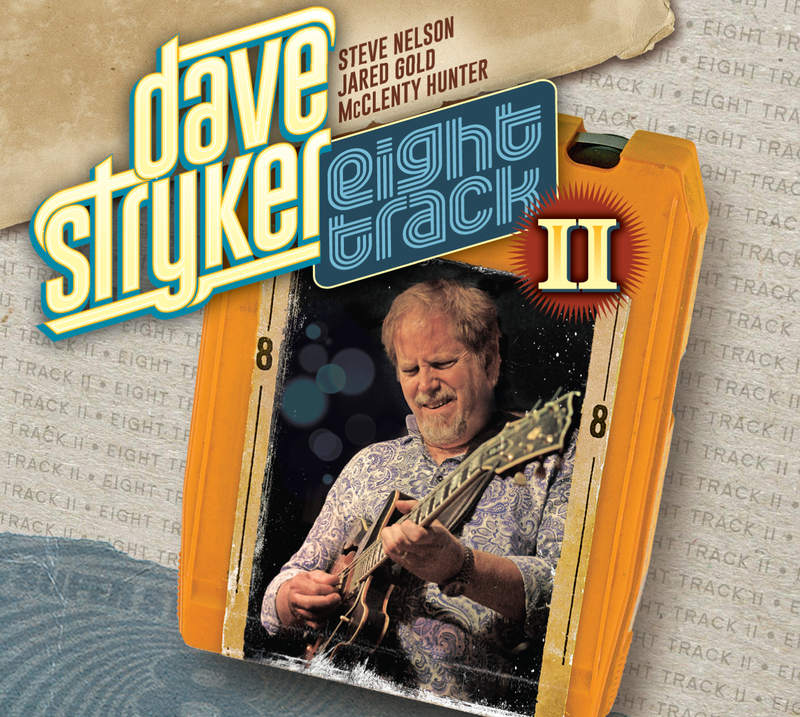 Exciting news: My new CD Eight Track II has just been released on Strikezone Records. It’s available here now. I can’t wait for you to hear it! Eight Track II features my working trio with Jared Gold on organ and McClenty Hunter on drums along with Steve Nelson on vibes. Hello Friends Hope you’re having a great start to summer season. The big news is we went back in the studio with my quartet and recorded some new music. It’s a surprise what I have in store, but keep checking in and I will keep you posted. It is with my working group of Jared Gold on Hammond organ and McClenty Hunter on drums with special guest vibraphonist Steve Nelson. I’m off to the Aebersold workshop at the University of Louisville for 2 weeks and then I’ll be back for some local gigs and then the Litchfield Jazz Fest Sat Aug 6. 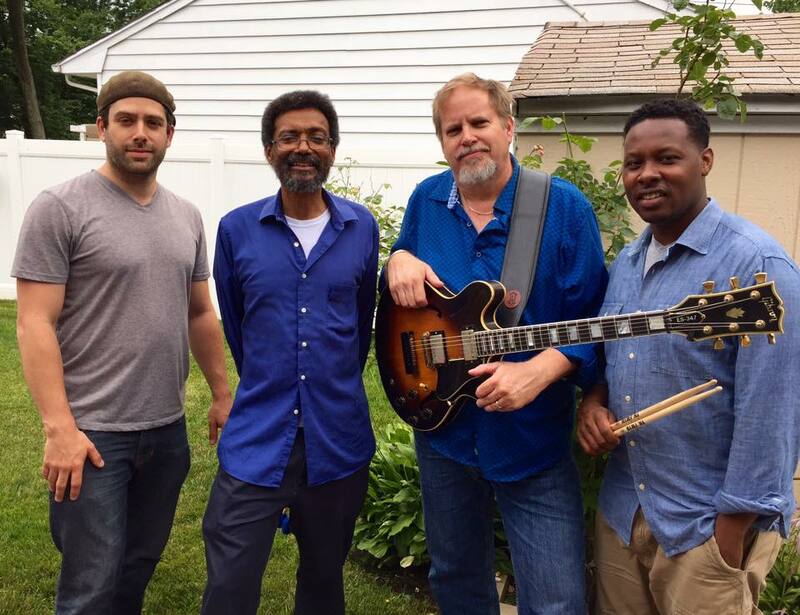 The Dave Stryker Quartet with Eric Alexander, Jared Gold and McClenty Hunter will be at the Monterey Jazz Fest(!) Sun Sept 16 7:30, and in LA the night before at the Nate Holden Theatre. The following weekend Sat Sept 24th the Dave Stryker Trio will be at the Savannah Jazz Fest. Please check my itinerary page for all upcoming gigs. Hope you’re having a great start to summer season. 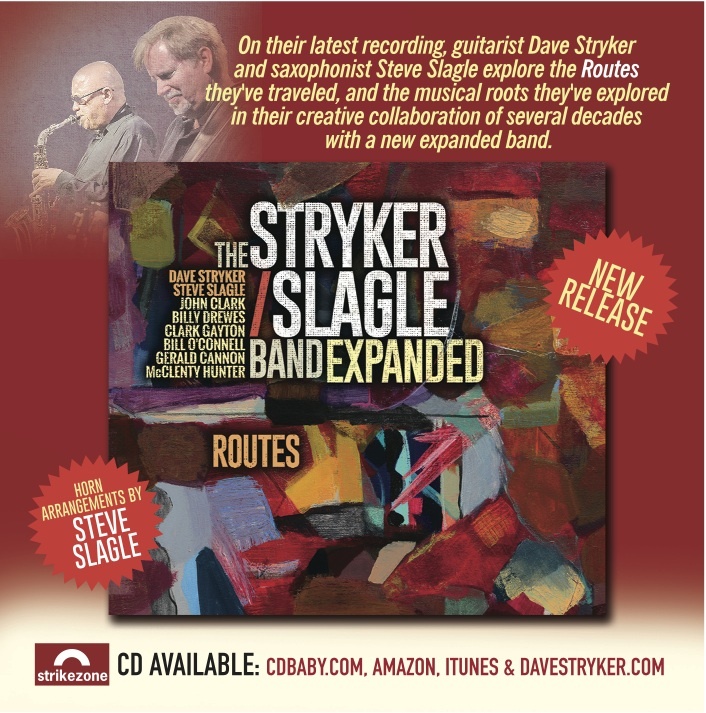 The Stryker/Slagle Band Expanded new CD Routes (Strikezone Records) received 4.5 Stars in Downbeat and has been getting great reviews and reached #2 on the JazzWeek Radio Chart staying in the top 50 for 14 weeks. We just finished doing a weekend at Smalls, playing music from Routes. You can order the CD right here on the site. Routes has stayed on the JazzWeek Radio chart for 13 weeks and got up to #2 so far. It is available on my website, CDBaby.com, Amazon, Itunes etc. Had great night at Chris’s in Philly with my quartet with special guest Chris Potter in Feb. Hope to do more with Chris soon. Hope all is well with you. My website has been re-done and we’re continuing to update it. Stay tuned for more updates coming soon. I’m off to Tucson to play at Univ of Arizona Mar. 10-11 and then to Graz Austria with The Plummer Jazz Sextet – a combo I lead from Indiana University. I come back in time to play at Birdland with Eric Alexander’s Quartet Mar 17-19. My birthday gig is Mar 26th at Trumpets, then to the Savannah Jazz Festival Swing Central last week of March and Snug Harbor in New Orleans April 14th. Routes has stayed in the Top Ten of JazzWeek Radio chart for 8 weeks and got up to #2 so far.